Rieslingspaschtéit is a beloved Luxembourg meat pie that’s filled with white wine jelly. A pure delight! When I was filming for my show in Bangkok, I needed to cook something for Luxembourg expat Pierre Metz. He requested a Luxembourg Thai fusion dish, and so this Rieslingspaschtéit was born! It’s amazing how well Thai flavours pair with Luxembourgish white wine (not only in a Paschtéit! ), so this really is a match made in heaven. I’ve also made this Rieslingspaschtéit for catering events, and people loved it so much. Even our prime minister Xavier Bettel and our crown prince Guillaume really enjoyed it when I served it to them. So, one could say that this Thai Rieslingspaschtéit has royal approval! You can watch me make this Rieslingspaschtéit in this episode of ‘Anne’s Asian Adventures’. On the first day, start by preparing the dough: Mix the flour and butter with an electric whisk. Dilute the salt in the lukewarm water and add to the flour mix with the egg. Beat to a smooth dough. Shape the dough into 2 discs, wrap in cling film and refrigerate overnight. Remove the mid-rib from the kaffir lime leaves and chop the leaves very finely. Grate the ginger. Trim the lemongrass sicks and chop as finely as possible. Cut the pork loin into cubes and put into a large container. Add the minced pork, white wine, chopped kaffir lime leaves, grated ginger, minced lemongrass, fish sauce, a bit of pepper and the salt. Mix well, cover and refrigerate overnight. The next day, take the chilled dough of the fridge 1 hour before you intend to roll it out. Peel and finely chop the shallot and add to the marinated meat with the egg. Mix well to combine. Make the egg wash by mixing the beaten egg with 1 tablespoon of milk in a jar. Unwrap one dough disc and place onto a lightly floured work surface. Roll out into a square 3mm thick . Put a heap of meat filling approximately 12cm long and 5 cm high in the centre of the square, leaving a generous border of approximately 10cm. Cut out a rectangle around the filling – the border needs to be wide enough so the long sides overlap by approximately 1 cm when you fold them over the meat filling. Fold the long pastry sides over the meat filling, sealing the edges with some egg wash and gently patting the dough together. Flatten the two shorter dough slabs to 3mm thick using a rolling pin. Cut o the excess dough so that you’re left with 2 flattened side slabs of approximately 5cm. Brush each one with some egg wash and fold in over the sealed pasty. Gently pat the dough down so that it is nicely sealed – it is essential that the pastry is sealed so the jelly stays inside after baking and does not leak. Turn over the pastry so the seams are on the bottom. 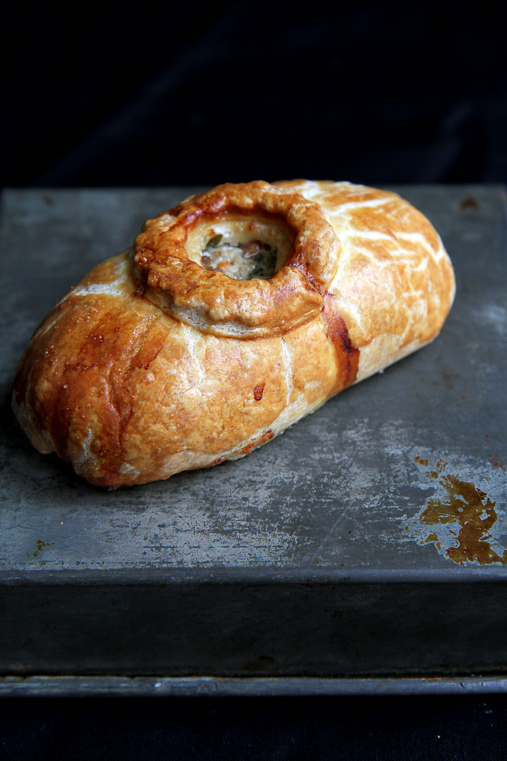 Using an apple corer, cut out a small hole in the centre of the pastry so the meat is exposed. Roll out a small piece of leftover dough to 3mm thick and cut out a wave-shaped circle with a cookie-cutter. Cut a hole into the middle of the circle with the apple corer. Brush the pastry with egg wash, then stick the wave-shaped circle onto the pastry so both holes overlap. Brush the wave-shaped circle with egg wash. Use a fork to lightly scratch a cross pattern into the egg wash on both sides of the pastry circle – this will give the Rieslingspaschtéit its trademark look. Place the Rieslingspaschtéiten on a baking tray lined with baking paper and bake at 160°C fan for 50 minutes. Just before they have finished baking, prepare the white wine jelly. Put the gelatine leaves in a bowl of cold water and leave to soak for 10 minutes. Drain and squeeze out any excess water from the sheets. Put the water, fish sauce and white wine into a saucepan with the gelatine leaves. Heat over a medium heat and stir until the gelatine leaves have completely dissolved. Pour the liquid into a jug. Place the baked Rieslingspaschtéiten on a wire rack. If there is anything clogging the little holes in the centre of the pastry lids, unclog them using a small spoon and clear the hole so that you can see the cooked meat inside. Leave to cool for 15 minutes. After 15 minutes, pour some white wine jelly into the holes, all the way to the top. The pastries will gradually soak up the jelly, so let them rest for a few minutes and pour some more jelly into each hole once it has cleared up again. Leave the pastries to cool completely, then repeat this process until all the jelly is gone (the jelly might have firmed up in the jug by then, simply reheat it in a microwave oven to make it liquid again). The Rieslingspaschtéiten will need to be stored in the fridge and will keep for over a week.